The title of this article may sound overly optimistic to some and downright incredible to others. Its main purpose is to help people explore a little-known (and even less-used) technology that may possibly serve as the lynchpin to your organization’s communications infrastructure. This report is based on my experience providing technical support and building technological capacity for the CTC VISTA Project. From the start of my service as an AmeriCorps VISTA in the fall of 2003, I was frustrated by the dearth of communications systems. Forget systems for a moment – obtaining mere contact information presented challenges. Project headquarters distributed a hardcopy of the Member roster at our orientation and provided two mailing lists (one which included all VISTAs and another for Boston-area VISTAs). Finally, a static web page on the CTC VISTA website sparingly listed the location and work site for each VISTA. One byproduct of this configuration was a deluge of email from Members whose organizations provided them new email addresses: "Hi! I have a new email address at my organization. Please update your records." Since the web-based roster didn't include a VISTA's work or home phone number, I couldn’t even call another VISTA to complain. Out of this exasperation the CTC VISTA directory was born, and what began as a pet project now represents one of my primary responsibilities. Let's look at the technology we used to move Project communications into the 21st century—and some of the capacities it provides. LDAP (light-weight directory access protocol) is an aptly named Internet standard that does precisely what it says: provide a specialized facility to disseminate contact information. Simply put, an LDAP server on your network houses an organization-wide address book. For years colleges and universities have utilized LDAP (and its arcane predecessor) to create "white pages" for their institutions. While enterprise-level entities most often deploy LDAP on their networks, I want to convince you that even a mid-sized non-profit can reap the benefits of LDAP-enabled services. LDAP-enabled services? What the heck are they, and why on earth would one want them? Well, LDAP doesn’t just supply a nifty address book (and one that happens to integrate nicely with email programs). Every record (or entry) in an LDAP directory can optionally have a password associated with it, thereby creating a database of readily available usernames and passwords. If you work at an organization which requires you to sign in to your computer, check your email, and access the internal network with distinct usernames and passwords, LDAP can replace all three accounts with a single sign-on: your directory entry. Back to Fall of 2003. Web-based roster. Annoying emails. Even more annoyed author. 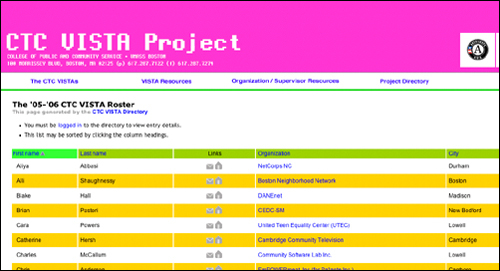 Over the course of that year I developed and refined a friendly, web-based interface to the CTC VISTA directory, designed by Project Director Paul Hansen. By Fall of 2004, a VISTA (past or present) could log in and edit her own entry, adding personal information like a home phone number, cell phone, even IM screen name. Headshots could be added, too. And when a VISTA received a new email address, she simply logged in and edited her entry; changes to the directory were instantaneous and published immediately. Lastly, access controls permit us to fine-tune levels of privacy and customize what information is available to whom. That year we also wanted VISTAs to be able do something different to satisfy their Project documentation requirement. Previously VISTAs had been expected to maintain a website or submit written reports, but the websites produced were updated infrequently, possessed little to no interactivity, and poorly represented the excellent work of the volunteers, though there were some remarkable exceptions. Paul and I wanted VISTAs to be able to focus their time and energy on content and not design or web mechanics. Weblog (blog) software, like Movable Type, quickly rose to the top of possibilities. Since comments to weblogs are emailed to the address in the Movable Type profile, a gateway had to be created to synchronize email addresses with the CTC VISTA directory. 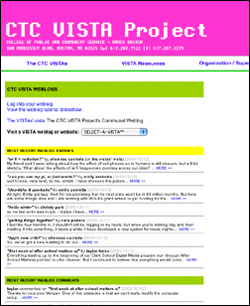 With this completed—along with some additional fixes—the CTC VISTA blogs were established, and our new information and communications system began to blossom. As the sidebar of additional technology implementation matters shows, the project took many months and was spread over time, integrated with numerous other projects. With focused attention and additional resources, it can go much more quickly. Lest you think building a communications infrastructure in 21 days is impossible, peruse this slideshow from my alma mater, Brandeis University, for a real-life example. Saul Baizman is a third year VISTA employed in multifarious capacities at CTC VISTA Project headquarters.